I loved the Moroccan cuisine. I found a cooking based on a fascinating, eclectic mix of ingredients. Meats prepared with dried fruits, cinnamon, and fiery spices long roasted in rustic tagines. Light, fluffy couscous with chicken, or lamb, with an abundance of vegetables. Intriguing sausages with hot harissa, and pastilla, a crispy pie with a surprising twist. Moroccan cuisine is "like a box of chocolate - you'll never know what you'll get." 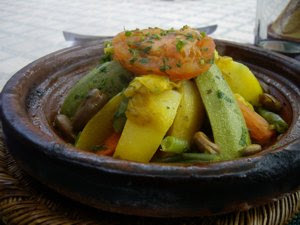 I knew the main elements of Moroccan cuisine. I was, however, surprised by the variation of spices, flavours, and heat. As Marocco is a Muslim country, you will never be served pork, as it is considered am unclean animal. We did, however, not miss that one moment. Beef, lamb, and chicken was prepared to perfection, and there was a wide variety of fish dishes available. There was an abundance of vegetables, and food was prepared with skill according to traditions taking care of texture, taste, and balance. My favourites were the tagines, a wide variety of dishes named after the rustic terracotta pot they are prepared in. They are often found cooking over open fire. As they are allowed to cook for a long time, the tougher cuts of lamb or beef are most often used. 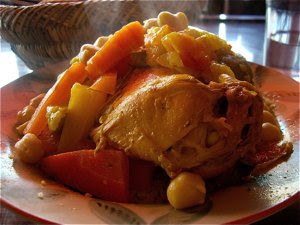 Another ingredient used in tagines are chicken. Cooking this way, the secret is (also always) in the other ingredients and the sauce. Moroccans use traditional vegetables blended with dates, apricots, figs, and an eclectic mix of spices as cloves and cinnamon, and additional sweetening as sugar or honey. All this creates exceptionally diversity in flavours from the more ordinary to the most exotic dishes with sweet perfumes and scents. Texture vary from the most tender and succulent meats created by hours cooking, contrasted with crunchy almonds prinkled on top at serving. Couscous is a food consisting of granules made by shaping moist semolina wheat. They are then coated with finely grounded wheat flowers. It is for Moroccans, as pasta is for Italians, a very filling staple food. Couscous is most often prepared in a couscoussière, a traditional steamer for this dish. Finely sifted grains of couscous is placed on top of larger pot for the meat, preparing all in one process. When the couscous is ready, you shape the grains into a large mound, pouring the liquid over, and arranging meat and vegetables on top. I chose couscous for dinner twice, feeling completely stuffed to capacity after both meals, as this is seriously filling stuff. The meat and vegetables tasted more as a traditional stew, with less contrasting flavours and spices. But you have to try couscous at least once, in order to get the whole culinary experience. Occasionally you find local dishes that seriously challenge the distant part your culinary boundaries. Pastilla (above) is certainly one these. 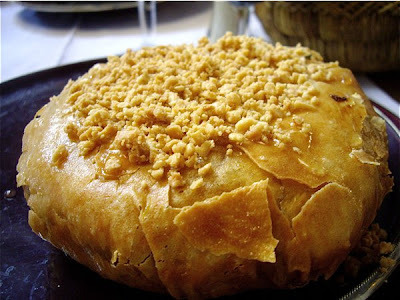 Pastilla (pronounced "bastiyya"; Arabic: بسطيلة‎) is a pie found in different shapes in the Maghreb. It is made from warka dough shaped into very thin sheets of pastry. Sheet upon sheet is used to cover a pan to prepare a base for the filling. On top of the warka dough you place pidgeon meat mixed with a savoury custard. The whole filling is seasoned with salt, sugar and spices. You can also get pastillas with other fillings. Then you cover the top with more warka, before the the top of the pastilla is finished off with a sprinkling of sugar, cinnamon, and almonds, before it is lightly baked. I had to try a Pastilla, at the Foundouk restaurant in Marrakech. 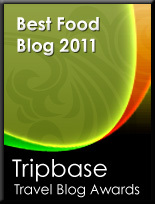 It was an interesting culinary experience, but hardly one that I would do more than once. The pastry was extremely sweet, and the pastry was not salt enough to balance up for it. Harira is another dish worth mentioning. It is a soup based on vegetables, lentils, meat and flavoured with Ras el Hainout (Arabic: رأس الحانوت‎), a popular blend of herbs and spices used across in the Middle East and North Africa. The name refers to a mixture of the best spices a seller has to offer. 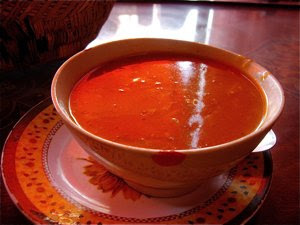 The soup is prepared with whatever ingredients available. It is a very delicious dish, reminding me of an Italian minestrone, rich, tasty and sometimes very spicy. 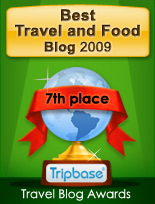 Do try it as a starter, we did several times, and we were surprised how differently they tasted at the different places. At the restaurants Al Fassia and Le Fes in Marrakech, it was served with lime to squeezed over and sweet dates to be immersed in the soup.